Tōn en tēde tē biblō periechomenōn onomata kai taxis = Eorum quae in hoc libro continentur, nomina & ordo. Venice : Aldus Manutius, 1 June 1497. Purchased with the Toovey collection, 1899. Imprint from colophon (leaf 3P[omicron]10r): "Excriptum Venetiis in domo Aldi Manutii Cale[n]dis Iunii. M.III D."
Printed in Manutius's types 1:146Gr, 2:114R, and 7:114Gk. Edited, with prefatory letter, by Aldus Manutius. Chronologically the fourth of the five volumes of Aristotle issued by Aldo Manuzio, but considered by him to form the third. Collation: ² 3a[alpha]-3z[psi]⁸ 3&[omega]⁸ 3[Alpha]-3[Beta]⁸ 3C[Gamma]⁸ 3D[Delta]¹⁰; 3[Alpha]a-3[Mu]m⁸ 3[Nu]n-3[Xi]o¹⁰; [alpha]a-[delta]d⁸ [epsilon]e¹⁰; a[alpha]-b[beta]⁸ 3A[alpha]-3O[xi]⁸ 3P[omicron]¹⁰: 520 leaves, leaf /2 blank. PML copy leaf dimensions: vol. 1 (PML 1130): 30.7 x 21 cm. and vol 2 (PML 1129): 30.7 x 21.2 cm. 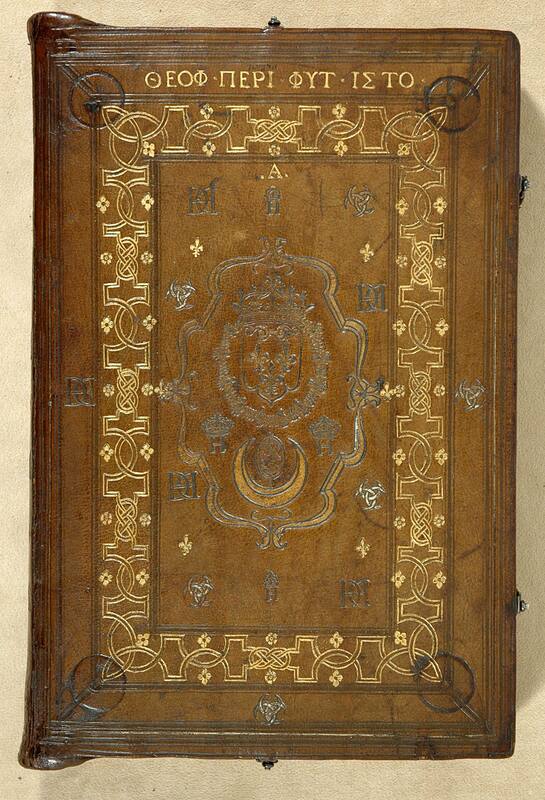 16th-century Italian gilt-tooled calf over paper boards (PML 1130: 31 x 22 cm. ; PML 1129: 31 x 21.6 cm. ), sewn on 4 supports; repaired by Sanford & Clarke. Plain paper pastedowns; plain endbands; gilt edges. [Joseph Juste Scaliger (1540-1609), note in Heber catalogue; Scaliger sale, Leyden, 11 March 1609, p. 10; Gerard Meerman (1722-1771) and Johann Meerman (1753-1815); Bibliotheca Meermanniana sale, The Hague, 1824, p. 216, no. 466; Richard Heber (1773-1833); Bibliotheca Heberiana sale, Sotheby's, Part I, 10 April 1834, lot 503, purchased by Payne and Foss; Mr. Miller of Lincoln's Inn (see Acheson note); James Bohn, bookseller to Acheson]; Archibald Acheson, Earl of Gosford (1806-1864), bibliographical note citing earlier provenance (formerly in box with PML 1126, now in departmental file); James Toovey (1814-1893); Pierpont Morgan (1837-1913), purchased with the Toovey collection, 1899.